Join the discussion on our forums! Come discuss Klaxxi Amber-Weaver over in our dedicated Klaxxi Amber-Weaver discussion topic. Battlecry: If your C'Thun has at least 10 Attack, gain +5 Health. Amberweaving is a specialty course at the local trade school. This is the best card in my C'thun deck, i run to of this with defende of argus and with the absence of silence you just can't counter this in any way posdible. This card is getting cut by one or entirely cut form a lot of top players C'Thun decks. I don't think it is OP but I did think was strong. Why do you think it is getting cut? I have some guesses. 1. You need too many vanillas to hit it consistently. 2. You ramp in Druid so you play 4 drops on turn 2 or 3 and there is no way it will be active on that turn. 3. We are in a world of 4 mana 7/7 that are not situational. 4. 4 dmg isn't a big threat and Zoo and Aggro can just ignore it and smash you death. I think number is 4 the biggest reason actually. Thats what I do when I see it, and it usually works, it can only kill 1 1/1 a turn so get rekt. I just realized another possible even bigger reason why it is getting the axe. Mana curve. The 4 drop spot is super competitive in Druid. Fandral Staghelm is a must. Swipe is a must. C'thun's Chosen is optional, and not great in the current meta. That is 7 four drops up for consideration with Klaxxi included. All the decks are running Azure Drake x2 now. You have to have a least one Nourish cus Druid's card draw engine hit the wood chipper. So now you have 10 or 11 mid game cards most of which don't pose any real threat to your opponent. Druid of the Claw is also getting cut. I think for curve reasons as well as it is a 5 drop. It should be only +2 health. or maybe cost 5 mana. I managed to play this as 4/15 at t4. Actually it's possible through the use of The Coin or Innervate. This is the op card of druid in new expansion. Now almost all druids play ctun deck, why they shouldn't? right? This card needs to be fixed, either make the C'thun requirements higher, or change his default hp to 1, like Twilight Drake so it at least gets countered by silence. If you silence this now, you are still losing, because the opponent is still left with a 4/5, which is still a solid 4-drop. I don't understand how this card made it past testing without identifying how insanely powerful it is. 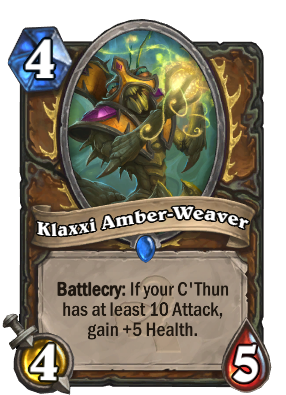 Did they not see how easy it was to buff your C'Thun to 10 attack?